Two Shot & Multi Shot Injection Molding | Thumb Plastics, Inc. If you’re new to two-shot plastic injection molding, you might think it is more complex, more expensive, or more time consuming than other plastic molding processes. Taken alone, those may be true, but two-shot also creates considerable functionality and savings. Maybe you’ve been turned off by a manufacturer’s quality or delivery issues. We’re here to tell you that you deserve better. Whether you’re new to two shot or needing a new two-shot supplier, Thumb Plastics is here to help. Because two-shot is all we do. 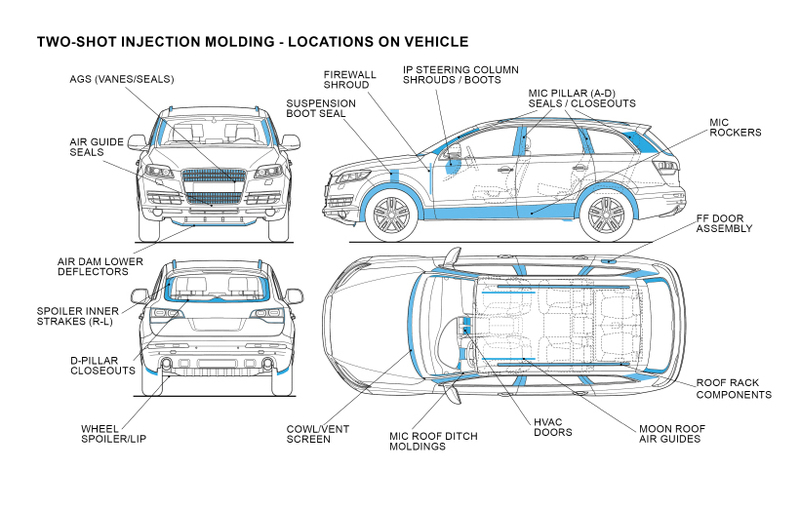 When a major automotive OEM failed a side impact crash test, they relied on their Tier 1 supplier and Thumb Plastics to develop a two-shot injection molding solution to reinforce the vehicle’s frame. In less than eight weeks, the OEM had their solution and passed the second crash test. When tolerances and on-time-delivery are important, OEMs choose Thumb Plastics for two-shot injection molded parts. We’re more than a manufacturer. We’re problem-solvers, working both with customers and vendors to build functionality, safety, and efficiency into everything we produce. You can rest assured you’re getting the quality you need at a competitive market price when you choose Thumb Plastics for your two-shot molding solutions. Two-shot, also referred to as dual-shot, double-shot, multi-shot and overmolding, is a plastic molding process in which two different plastic resins are molded together in a single machining cycle, as illustrated below. 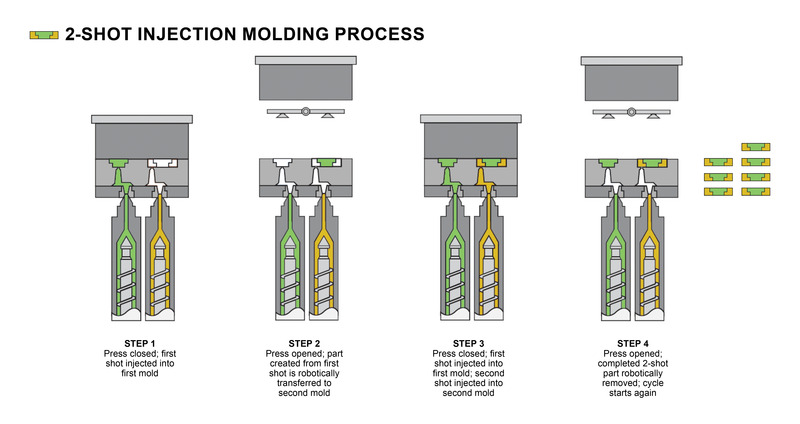 There are two phases of the two-shot molding process. The first is similar to traditional injection molding: A shot of resin is injected into a mold and cooled to form a solid part. In the second phase, the just-molded part is transferred to a second mold via a rotating platen or a robotic arm, and receives the second shot of resin – in, through or around certain parts of the first molded part, depending on the design. The two plastic resins then form a molecular bond and the multi-resin molded part is cooled and ejected. The process isn’t difficult to understand, but it’s highly difficult to master. It requires high levels of technical expertise and attention to detail, and even the smallest mistakes can cost big money, especially in high-volume production scenarios. That’s why it’s critical to find a highly capable supplier. Look for excellent supplier quality scorecards, defined processes to mitigate against flash, flow lines, and short-shots, and contingency plans to expand capacity as your business and your two-shot molding needs grow. Once you find a supplier, involve them early on in the design phase of your part. They can identify potential problem areas and engineer value into your product. To get a jump-start on your two-shot part design, download our free Two-Shot Injection Molding Design Guide today! Two-shot injection molding is the ideal plastic molding process for complex, multi-color, and multi-material plastic products, especially in high-volume production scenarios. Thumb Plastics services a variety of industries including lawn and garden, agriculture, medical, consumer, and appliance, with significant experience in automotive. Part Consolidation | Two-shot injection molding reduces the number of components in a finished assembly, eliminating an average of $40K in development, engineering, and validation costs associated with each additional part number. Improved Efficiency │ Two-shot molding allows multiple components to be molded with a single tool, reducing the amount of labor needed to run your parts and eliminating the need to weld or join components after the molding process. Improved Quality │ Two-shot is carried out within a single tool, allowing for lower tolerances than other molding processes, a high level of accuracy and repeat-ability, and reduced scrap rates. Complex Moldings │ Two-shot injection molding allows for the creation of complex mold designs that incorporate multiple materials for functionality that cannot be achieved through other molding processes. The customer is a Tier 1 international automotive supplier with an emphasis on innovation and technology. The company’s products include automotive exteriors, closures, roof systems, and seating – to name a few. The customer was having issues sealing off an active grille shutter (AGS) system with the air guide seals. The innovative under-the-hood system was designed to help OEMs meet CAFE standards by redirecting air around the vehicle to reduce drag. The sealing components of the system are absolutely critical and the manufacturing process to make them – two-shot injection molding – is difficult to master. The customer was quick to realize this as the incumbent supplier failed to meet stringent quality standards. The customer had to find a supplier experienced enough to manufacture the complex part. Needless to say, the customer turned to the two-shot experts at Thumb Plastics, Inc. (TPI), a Gemini Group company, for design and engineering support and innovation. The key to TPI’s success lies within its culture of continuous improvement, it’s adherence to Lean – one piece flow – manufacturing, and its commitment to delivering quality products at a competitive market price. Drawing form over 30 years of experience launching hundreds of two-shot interior, exterior, BIW, and underhood applications, TPI was able to quote the four-component, multi-million dollar program in less than a week and was awarded the program soon after. The final production design was guided by our internal design support team, optimized for DFM, and is set for production in 2019. The final part design exceeded the customer’s expectations, along with our highest quality and OTD standards. In addition, the efforts of TPI’s in-house part and tooling design team reduced the mold expense to our end customer with a savings of nearly $200K in tooling. We’ve spent the past 30 years mastering the art and science of two-shot injection molding. Thumb Plastics has the design, engineering, and in-house tooling capabilities you need to streamline your project from conception to production. And as a financially stable company, we’re prepared to expand capacity and scale operations as your company and your two-shot needs grow. What are you waiting for? Our technical sales team is standing by to give you the information you need to make an informed decision about two-shot.